Costume jewelry delivers sparkle at a cheaper price than real precious metals and gems but without proper care, fake jewelry can discolor and lose its shine. 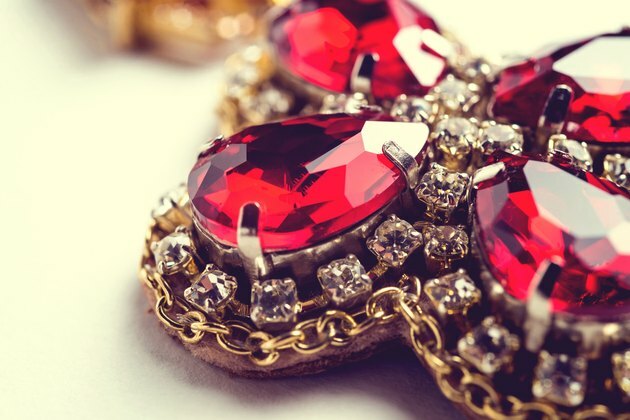 Besides losing or changing color, costume jewelry is more susceptible to dings and stains. Treat your favorite, fake pieces with as much love and care as the real thing and you can keep them lustrous for years. A combination of regular jewelry maintenance, cleaning and storage will help you preserve your accessory investment. Fill a bowl with warm water and a pH balanced, liquid soap. Avoid cleansers containing alcohol, acid, vinegar or ammonia. These chemicals trigger rust and can damage your pieces. Soak your jewelry in the bowl for a few minutes. If cleaning vintage, foil-backed rhinestone jewelry, do not soak these. For rhinestones, spray glass cleaner on a dry cloth. Wipe fake jewels like rhinestones with the cloth. Dry the jewelry with a microfiber cloth. Thick cotton towels can snag on jewelry that has prongs or brackets. Your jewelry should be completely dry before you store it. Line a container with anti-tarnish paper. Place the jewelry in a container with a lid, like a jewelry box. Do not store multiple jewelry pieces in one container. This can cause tarnish and discoloration. A soft pouch makes a good storage container for jewelry. Keep the lid closed on your jewelry boxes when not in use. Protect the jewelry from dust and keep them out of direct sunlight. Examine the jewelry before wearing it, checking for broken prongs or missing stones. Repair broken jewelry to avoid further damage. Take jewelry off first when getting undressed. Put jewelry on last to when getting dressed to avoid unnecessary contact with perfume, lotion or hairspray. Do not clean costume jewelry with baking soda. This product is too abrasive for fake jewels.